You may find crunchy cod tongues at a Newfoundland kitchen party—if you’re lucky! Courtesy of Ray Palmer, St. John’s, N.L. 1. Wash tongues carefully; dry with paper towel. Add flour, salt and pepper to plastic bag. Add tongues, shaking bag to coat. Set aside. 2. 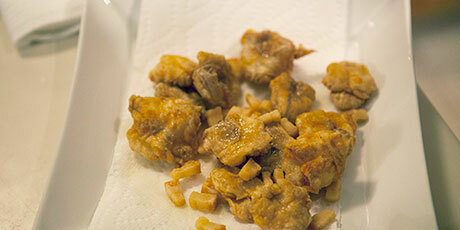 Cut pork fatback into small cubes. Add to skillet; fry at low to medium heat until fat is rendered out and fatback is crispy and brown. (Don’t overheat or the fat will burn.) Remove pork scrunchions; set aside. 3. Add tongues to same skillet; cook over medium heat until tongues are brown and crispy on both sides. Put scrunchions back in skillet when tongues are almost ready. Cod tongues can be served as an appetizer by themselves or served with fries as a main meal.